The inflow of water from the open boundaries into the North Sea is calculated with a three- dimensional Eulerian transport model to estimate the influence of the different water masses into the North Sea (LUFF AND POHLMANN 1995). The water entering through the open boundaries of the North Sea (i.e. 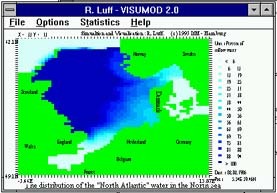 the North Atlantic, the Channel of England and the Baltic Sea) is marked with a passive conservative tracer in order to follow the dispersion of these specific water masses. The simulations clearly demonstrate the dominance of the North Atlantic water mass in the North Sea. Integrated over the entire North Sea about 85% 10% of water originates from this source whereas water from the English Channel and the Baltic Sea only have an influence of about 7.5% 3% each. The influence from the both smaller sources is only remarkable in some specific regions like the Skagerrak for the Baltic Sea inflow or the Southern Bight for the Channel inflow. The variability of the weather systems has an decisive impact on the distribution and the motion of the watermasses as well as on the dispersion of matter. The resulting fluctuations are a prominent feature of all the animations. Luff, R. 1994 : "Ausbreitung passiver, konservativer Substanzen in der Nordsee unter Verwendung eines hydro- und thermodynamischen Langzeitdatensatztes", Diplomarbeit im Fachbereich Geowissenschaften an der Universität Hamburg. LUFF, R., T. POHLMANN, 1995 : "Calculation of the water exchange times in the ICES-Boxes with an Eulerian dispersion model using a half-life time approach", Deutsche Hydrographische Zeitung, Band 47, Heft 4, 287-299.